Tirumala is encircled by a number of sacred water bodies (theerthams). All those theerthams are known for its holiness. Among them, Japali theertham is the most widely known holy theertham which is being visited by most pilgrims. 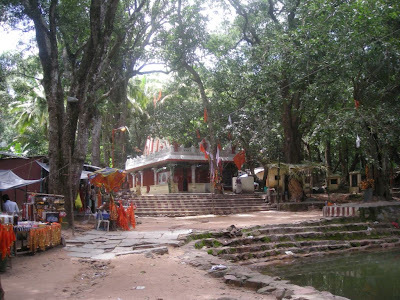 The prime attraction here is a temple dedicated to Lord Hanuman (Anjaneya swamy). The Anjaneya swamy temple at Japali Theertham, is one of the least known and most worthy places of visit in Tirumala. Japali Aanjaneeya swamy temple, which is located in Tirumala 7 kms from Sree Venkateswara swamy (Lord Balaji) temple. The spot is on the way to Akasa Ganga from Tirumala. From road we have to walk nearly 1 km inside the forest. Pilgrims visiting Tirumala will never fail to take a bath in this Japali Teertham, as it believed that all their sins and evils will be washed out when they dip in the teertham. It is said that Lord Rama with his consort Sita and brother Lakshmana stayed here along with Lord Hanuman. There is a perennial pond, called as "Rama Kund", in the temple premises that was said to be the source of drinking water, during their stay here. There is a water source flowing to this place and it is not known where the water comes from. Sage Jabali performed penance at Sri Hanuman’s birthplace atop Tirumala and Sri Hanuman revealed himself at the spot. So it is known as Japali Hanuman Kshetra. APSRTC runs a daily 'Travel as you like' bus service from Tirumala to Papavinasanam, covering important places on the way like Venugopala Swamy temple, Akasha Ganga and Japali. Frequency: Every 30 minutes, from 05:00 hrs to 19:45 hrs. You can also reach Japali by your own vehicle or local taxi, but you need to walk 1 km inside the forest.